A large flare can release energy equivalent to the explosion of more than ten million hydrogen bombs in a feu minutes' time. Momentary temperatures exceed twenty million K, hotter than in the dense core of the Sun (Eddy, 1979). The small fraction of the energy of such flares, that the Earth intercepts, is adequate to generate striking effects in the upper atmosphere. These effects are produced by the ultraviolet, x-ray, and energetic particle emissions from flares and other eruptions, and not by an appreciable change in the overall output of the Sun, uhich at most reaches one thousandth of 1%. None the less, single energetic eruptions and periods of enhanced flare activity seem to be related to weather. Roberts (1979) stated: "We now have, I venture, pretty solid evidence that there are some bona fide influences of variable solar activity on the troposphere that operate at the weather lead time of a feu days". Indirect evidence of this is the observed change in the quality of weather forecasts after flares. Scherhag (1952) observed a sharp degradation of the precision of weather predictions in Great Britain and Germany after the proton flare on February 23, 1952. This connection uas corroborated by Reiter (1979a), who investigated a sample of 79 flares observed January 1975 to January 1977. He found a 14$ increase in weather forecasts of poor quality on the key day, marked by stratospheric intrusions of Be7. According to Reiter (1979b) the Be7-concentration in the troposphere is a measure of the intensity of strato-spheric-tropospheric exchange caused by flares. The Sun, rotating on its axis, and the Sun, revolving around the center of mass (CM), could be looked at as coupled oscillators capable of internal resonance, resulting in slight positive or negative accelerations in the Sun's spin. Such accelerations are actually observed. Speeding up or slowing down of the Sun's rotation rate is liable to influence the Sun's activity. Slower rotation seems to be linked to enhanced activity and faster rotation to weak activity. According to investigations by Eddy (1977), based on historical observations by Scheiner and Hevelius, the rotation of the Sun's equator sped up just before the Maunder minimum, while its rotation rate about 1620, near a secular maximum of sun-spots, was much the same as it is today. Modern observations confirmed this relation. Mt. Uilson observations (Howard, 1975), presented in Fig. 1, show two striking jumps in the Sun's rate of rotation in 1967 and 1970. These jumps occurred when the Sun'scenter, the center of mass of the solar system, and the planet Jupiter were on a line. These heliocentric constellations are indicated in Fig. 1 by arrows. Jupiter plays a dominant role even among the giant planets, that regulate the Sun's oscillations about CM. Jupiter holds 71% of the total mass of the planets and 61% of the total angular momentum of the system, while the Sun governs less than 1% of the angular momentum. This seems to be indicative of a case of spin-orbit coupling of the spinning Sun and the Sun revolving about CM, involving transfer of angular momentum from Jupiter to the revolving Sun and eventually to the spinning Sun. With respect to the angular momentum conservation law, it makes sense that the observed slowing down in the Sun's spin went along with an increase in its orbital angular momentum. energetic eruptional activity around these events (Landscheidt, 1976). As to the activity in 1982, the reliability of the relation was tested by a long range forecast. X-ray bursts are a good measure of the energy released by flares. They were listed since 1970. Bursts greater than X9 are rare events. Only two of this category occurred 1970 to 1981. According to a forecast issued 3anuary 1982, events greater than X9 were expex-ted 29 April to 5 May, 22 May to 9 June, and 27 September to the middle of December 1982. The observations match the prediction. Bursts X12, X12.9, and X10 occurred on 6 June, 15 December, and 17 December 1982. In addition several X7, X8, and X9-events were observed. The forecast was checked by the Space Environment Services Center, Boulder, and the astronomers Gleissberg, Pfleiderer, and Ub'hl. If the interval from one conjunction or opposition of Jupiter and CM to the next one, from one jump in the Sun's rotational velocity to the next one, is looked at as a cycle and subjected to Fourier analysis, the fourth, fifth, and sixth harmonic prove to be strong. A superposition of these harmonics forms a neu cycle, the mean period of which is 2.25 years, one fourth of the fundamental. 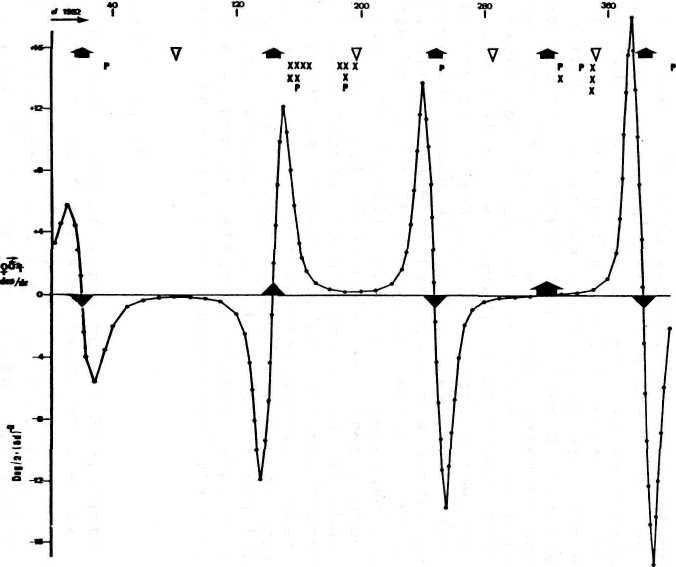 A Pearson-test of x-ray bursts ^ X1, related to this shorter cycle, yields the value 40 for 1 degree of freedom (P< 0.00001) for the years 1970 to 1974. A replication for the fundamental period 1974 to 1982 gives out the value 79 for 1 degree of freedom (P“0 .00001 ) . Fig. 1. Sudden decrease in the Sun's rate of rotation (from Howard, 1975) related to heliocentric conjunctions of the planet Jupiter and the center of mass. The Sun's oscillations around CM are regulated by changing constellations and variations in the distance of the four giant planets. Another cycle is generated by the tidal planets Venus, Earth, and Jupiter. There is a wealth of literature dealing with a presumed influence of tidal planets on sunspots. Critical authors stress that all tidal planets, when conjunct, could only raise a tide of a feu millimeters on the Sun. But it should be taken into consideration, that the horizontal component is not negligible, since the Sun's gravity acceleration is 28 times that of the Earth's, flpik (1972) has shown that the mean velocity of tidal currents on the Sun reaches about one third of tidal currents generated by the Moon on Earth. As to relations of tidal planets with flares, there are only feu papers (Blizard, 1965; Svest-ka, 1968; Landscheidt, 1976, 1981, 1983). This disproportion is not justified. We knou from Skylab observations that flares are set off by initial disruptions in hot coronal loops over active regions ( Eddy , 1979). It is easier to imagine that tidal disturbances may trigger such events in an unstable zone of the Sun's atmosphere than to concede that tide generating forces could act on the strong magnetic fields constituting sunspots. Calculations of the relative tidal force of the planets Mercury to Saturn shou that the latter is negligible as well as Mars, l/enus is sometimes stronger than Jupiter. Comparison of the combined vector of the tidal forces of Venus, Earth, and Jupiter, including or excluding Mercury, shows that the vector including Mercury oscillates around the vector of l/enus, Earth, and Jupiter. Therefore, only the latter has been investigated in its relation to energetic flares marked by x-ray bursts. Fig. 2. The change in the direction of the vector of the tidal forces of Venus, Earth, and Jupiter, measured by the angular acceleration d(0/dt, forms a cyclic pattern uhich correlates with energetic solar eruptions. The plot shows the course of dw/dt and the distribution of energetic x-ray bursts in 1982.
values. These zero phases are indicated in Fig. 2 by fat triangles, and in one case by a fat arrow. The effect is stronger when the curve ascends than ghen it descends. The strength of the effect on flares is inversely proportional to the steepness of the ascent. Slow ascent releases prolonged flare activity reaching a high level of energy display. The fat arrow in Fig. 2 marks such a situation. In 1982 the ascent, marked by a triangle pointing upwards, had as strong effects as the second case with slou ascent. But this category showed a stronger overall effect since 1970. The lull begins always in the middle between two zero values. On top of Fig. 2 the active and lull phases of the flare cycle are marked by arrows pointing upwards and open triangles painting downwards. Observed proton events (P) and x-ray bursts ^ X3 (x) match the phases of activity without exception. If all of those 106 x-ray bursts = X2 observed since 1970 are tested, 91 of them fit active phases in the cycle and .only 15 inactive ones. A Pearson test yields the value 52 for 1 degree of freedom (P< 0.00001). All events ^ X6 fell into the active periods. As the sample covers 36 cycles and shows a homogeneous distribution, the result points to a dependable relation. The high level of significance breaks down when less energetic flares are analysed, even if they belong to an upper optical category. Such optical flares are no reliable indicator of solar-terrestrial relations. Unfortunately, many interdisciplinary papers dealing with solar-terrestrial interaction do not consider this, even if the author investigates flares because he knows that flares are a better criterion than sunspots. Beside the prediction of x-ray bursts >X9, mentioned already, long range forecasts, based on the flare cycles presented and on additional experience, shouied significant reliability. Predictions of periods of energetic x-ray bursts and proton events were published one year in advance and checked by the Space Environment Services Center, Boulder, and the astronomers Gleissberg, Pfleiderer, and Uohl. Out of 29 events observed 1979 to 1981, 27 hit the predicted periods of activity (Land-scheidt, 19831. A Pearson-test yields the value 20.9 for 1 degree-of freedom (P<0.00001). A neu forecast, issued January 1983, covers the period 1983 to 1990. In 1983 all events ^ X1 observed match the predicted periods of activity. These results, when judged with respect to the relations between energetic flares and weather discussed above, should encourage interdisciplinary research, which could lead to an improved understanding of the phenomena involved. Blizard, 3.B., 1965. Predictions of solar flares months in advance. Astron. 3. 70, 667. Bossolasco, PI., Dagnino, I., Elena, A., and Flocchini, G., 1972. Instituto Universitario Navale di Napoli, Pleteorol. Oceanog. 1, 213. Bucha, \l. , 1983, Direct relations between solar activity and atmospheric circulation, its effect on changes of weather and climate. Studia geoph. et geod. 27, 19-45. Cobb, U.E., 1967. Evidence of a solar influence on the atmospheric electric elements at Mauna Loa Observatory. Plon. Weather Rev. 95, 905 - 911. Eddy, J.E., 1977. The case of the missing sunspots. 3ient. American 236, 80 - 92. Eddy, J.E., 1979. A new Sun. The solar results from Skylab. NASA SP-402. Washington D.C.
Howard, R., 1975. The rotation of the Sun. Scientific American 232 106 - 115. Landscheidt, T., 1976. Beziehungen zwischen der Sonnen-aktivitat und dem Massenzentrum des Sonnensystems. Nachr. d. Olbers-Ges. Bremen, No. 100, 2 - 19. Landscheidt, T., 1981. Cycles of solar flares. In: Abstract Volume 9th International Congress of Biometeo-rology, Osnabru'ck 1981 (eds. Overdieck, 0., Pluller, ZJ. , Lieth, H. ) , p. 103. Landscheidt, T., 1983. Solar oscillations, sunspot cycles, and climatic change. In: Weather and climate responses to solar variations (ed. Billy PI. PlacCo rmac) , pp. 293 - 308. Colorado Associated University Press, Boulder, Colorado. flarkson, R., 1979. Atmospheric electricity and the Sun-weather problem. In: Solar-terrestrial influences on weather and climate (eds. Billy PI. MacCormac and T. A. Seliga), pp. 215 - 232. Reidel Publishing Company. Pluir, M.S., 1979. The role of atmospheric electricity in Sun-weather relationship. In: PlcCormac and Seliga, 1979, pp. 259 - 262. Neubauer, L., 1983. The Sun weather connection. In: McCormac, 1983, pp. 395 - 397.
dpik, E., 1972. Planetary tides and sunspots, Irish Astron. 3. 10, 298 - 301. Reiter, R., 1979a. Influences of solar activity on the electric potential between ionosphere and Earth. In: PlcCormac and Seliga, 1979, pp. 243 - 251. Reiter, R., 1979b. Influences of solar activity on the exchange intensity between stratosphere and troposphere. In HcCornac and Seliga, 1979, pp. 289 - 296. Reiter, R., 1979c. Influences of solar activity on the electric potential between ionosphere and Earth. In: McCormac and Seliga, 1979, p. 245. Roberts, U. 0., and Olson, R.H., 1973. Neu evidence for effects of variable solar corpuscular emission on the weather. Rev. Geophys. Space Phys. 11, 731 - 740. Roberts, U. 0., 1979. Introductory review of solar-terrestrial weather and climate relationships. In: flcCarmac and Seliga, 1979, pp. 29 - 39. Scherhag, R., 1952. Die explosionsartigen Stratosparen-eruarmungen des Spatwinters 1951/52. Berichte d. Dt. Wetterd. US-Zone No. 38, 51 - 63. Schuurmans, C.J.E., 1979. Effects of solar flares on the atmospheric circulation. In: McCormac and Seliga, 1979, pp. 105 - 118. Svestka, Z., 1968. On long-term forecasting of proton flares. So. Phys. 4, 18 - 29. Zerefos, C.S., 1975. Planet. Space Sci. 23, 1035. N.-A. Morner and W. Karlen teds, Climatic Changes on a Yearly to Millennial Basis, 473-481. © 1984 by D. Reidel Publishing Company.